Noticing a change in your body’s appearance is never an easy thing to accept and while some individuals may overlook a discolored nail and set it aside as nothing, a black toenail is not something that should be taken lightly. Although the reason for a black toenail may be a minor issue such as a bruise as a result of hitting it against something, change in the color of the nail often indicate that there is something wrong; therefore, a black nail must be attended to immediately. As was mentioned before, the reason for black nails varies; however, the most common cause is blood beneath the harden tissue of the nail. A bruised toe may cause blood to drain into the nail bed, changing its color. This condition is known as a subungual hematoma and is normally caused after repetitive bruising of the toe or it can also occur instantly after your foot experienced a very hard blow. While unsightly, most blackened toenails aren’t painful and for most people, the discolored toenail will eventually fall out and be replaced by a newly grown one. In other cases, however, the blood pools under the nail, giving off a foul odor and discharge. In other rare cases, the sign of a black toenail is an indication that there is a fungus growing under the nail. Black nail fungus often affects the toenails, although in rare occasions, it may be found in the fingernails as well. This type of fungus is very infectious and normally affects people who frequent public pools, showers and other areas barefooted. Injury to the foot or toe as was mentioned before, can lead to the blood from a broken vessel settling under the nail bed since it has nowhere to escape. The color of the blood, then gradually changes from red, to purple, then to black; leading to what we are now discussing, a black toenail. This type of nail fungus is dangerous because it does not only infect the cuticles of the nails; it also destroys the keratin found within the nails. This fungal infection is also very popular with athletes and basically anyone who runs or walks a lot. This infection is extremely popular in the 65 and older age range because the older you get, the weaker the nails become, making it susceptible to injuries and infections. People who wear close fitting shoes and cut their nails close down to the skin may also experience black toenails from time to time as little cuts in the skin provide an opening for infections to enter the nail bed. In most cases, the nail of the big toe is the one that is affected by a fungal infection. If you have an infection, you will recognize some of the above mentioned symptoms; blood pooling under the nail, which changes from red, to purple/blue and then finally, it becomes black. Other than the unpleasant appearance of a toenail turning black, the pain it may cause may affect your daily function and cause you to be less efficient than normal. If you suspect that you have this particular type of nail fungus, examine the color closely because another nail infection known as Green Nail Syndrome may be the culprit behind your discolored nails. This fungal infection comes with a blue-green or dark green color and is caused by the Pseudomonas aeruginosa bacterium. Like most other nail infections, a black nail can be treated using a number of different home remedies and or prescription medications. However, before deciding on the best treatment for your condition, assess your infection and if you have severe pain along with the discoloration, visit your doctor and do not attempt to treat the condition on your own. 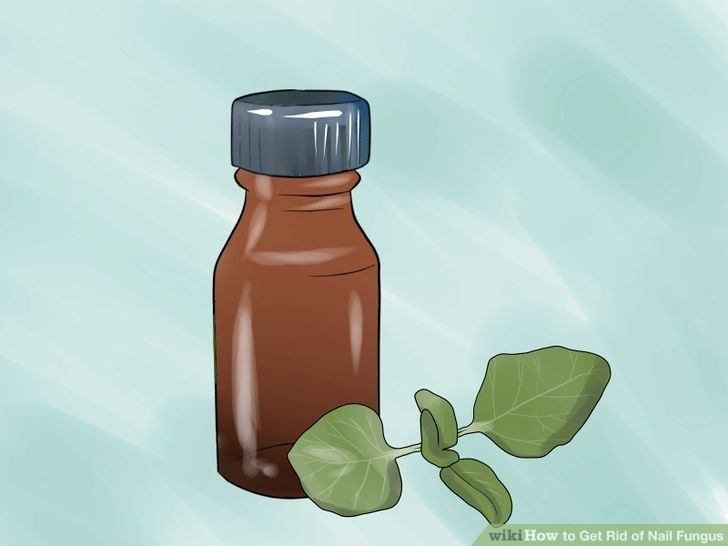 If the infection, however, is minor and pain free, you may opt to use one of the following remedies to prevent the fungus from spreading and becoming a more serious issue than it need to be. • Listerine and VapoRub – as weird as it may sound, different people have reported significant success when they use this combination to treat nail infections. While this method may prove successful for some individuals, not everyone will have the same luck. When applied to the surface of the nail, VapoRub has been known to stop the growth and spread of the infection but it will not treat it completely. • Tea tree oil – this is a known antiseptic that has been in use for centuries to combat fungal infections. It is extremely powerful and is used around the world to heal, treat and fight various fungal infections every day. • Hydrogen Peroxide – is a very common ingredient that can be bought at your local pharmacy. When mixed half and half with water, hydrogen peroxide has been known to help with the treatment of black toenail infections. It is recommended that the infected toe/foot be soaked in this mixture for 20 minutes twice a day. • Vinegar – apple cider vinegar is like a cure all; it can treat almost any infection known to man. While this treatment option may not clear the infection 100%, using vinegar will help to stop the spread and give you a better chance of getting rid of the infection once and for all. If you have come to an impasse and find that home remedies do not work in treating your infection, you may want to try over-the-counter medications or prescribed drugs from a doctor. Over the counter medications are topical treatments that do not penetrate the nails. Based on the treatment used, these over-the-counter medications may need to be applied once or twice a day and based on the severity of your infection may become a tedious and ineffective treatment option. If this treatment method is not working for you as well, it is time to seek medical attention. • Topical Antifungal Prescription – these topical treatments include lotions, nail polish, creams and gels and they are applied to the surface of the nail and around affected areas as well. Medicated topical treatments, unlike over-the-counter treatments will penetrate the nails and by penetrating the nails, they a quicker and more aggressive treatment option. • Oral Medications – are the best options for treating a nail fungus, but is a little dangerous for some individuals because the side effects include skin rash or can be very dangerous and cause liver damage. Patients that are given oral medications are monitored closely and may be required to do routine blood work to check their overall health. Oral medication, although extremely powerful on their own, are oftentimes combined with topical treatments to provide the most effective treatment course possible. While oral medications are used in severe fungal cases, these medications will not work all the time and your doctor will need to take a more invasive method such as surgery. The surgical procedure involves the removal of the infected toenail or fingernail. If your doctor notices that the infection is recurrent, he will also recommend that the nail be surgically removed. Once surgery is completed, a topical cream or other topical treatment may also be prescribed to treat any remaining fungus that may be found in the bed of the nail. After surgery, a new nail will regrow; however, new growth will be slow and tedious and can sometimes take as long as one year to regrow; therefore, surgical procedures are always a last resort. If you are prone to nail infection or is getting one for the first time, think about the various treatment options available to you. Be sure to assess the damage before deciding to treat the infection yourself and see a doctor if the infection is too severe for home and over the counter remedies. While black toenail is not a life or death situation, it is a serious condition that can cause severe pain and other ailments; therefore, it is advised that you commence treatment immediately if you notice your nail changing color over a period of time. There are many options available to you and if the treatments mentioned above do not suit you, there is also the option of laser treatments. Laser treatments employ the use of light to reduce the spread of the infection and to also remove it. While some people find this treatment useful, others do not. Laser treatment is, however, something to think about, but keep in mind that it is very expensive and is not covered by insurance; neither is it offered everywhere. Black toenail is unpleasant and while some people may overlook the symptoms and ignore their changing toenail, you should not do this. Instead, seek medical attention or visit your pharmacy to learn about the best treatment option available.